What I find interesting is, that on my local beaches, you rarely see foilers out when the wind drops. They come into shore just like everyone else. I'm not sure if that's because they don't want to take the risk of the kite dropping or that light wind foiling takes another level of skill that only few foilers have. With all this talk about how awesome foiling is for light winds I would expect to see all the foils come out when the wind is below 15 knots. Don't know. Ask your local foilers. Often we're out having great foiling sessions when other kiters don't even go to the beach. That's partly because we can ride in light winds, and partly because all those light wind forecasts have a lot more wind than predicted. We get the session because we're there. Our fun wind range is from 10 knots to well over 30+ knots using kites 12m-4m. With experience there is no real limit to the range you can get out of a big kite, or a small kite. My 12 and 15.5 kites are ok to 20+ knots. The 4m can go down to the high teens. We foil in all conditions (flat, waves, light, strong) and use a mid-size wave foil (J Shapes Cruzer). The foil makes a huge difference in the bottom end riding, and the ability to handle big waves and tiny kites. I normally get to the beach an hour or so before the other crew, have a good session on a 7m kite, and continue to ride until the last of the rest of the crew finish. My general rule is to use a kite half the size of whatever the surfboard or TT people are using. Even that is flexible. It's fun to whip around with the 4m, or boom around on the 10m. Foiling is awesome in light winds because you're powered, you not just lawn mowing and praying you don't get stuck in a lull down the far end of the beach. Having a foilboard doesn't mean you have extra powers to keep an inappropriate kite in the air. There is a misconception amongst some that your 9m rebel or such which falls out of the sky at 15kts will magically stay in the air at 10knots if you own a foilboard. If you can keep whatever kite you have in the air and relaunch it you usually have a session on a foilboard. The reverse it true to an extent on a foil. On a TT you inherently have more line tension. If the wind drops you can just sit down and figure-8 the kite to keep it in the air. On a foil you have to be constantly riding upwind to maintain apparent wind and line tension. As soon as you stop then the apparent wind goes and so does line tension. One of the worst things in foiling is watching your kite inexorably settle down to the water. It is possible to do a pivot gybe on a foil and send the kite hard across the window. None of that is easy. A relatively large (12m) lightweight kite seems to have an edge in sketchy light conditions. It's easier to drift it into the window and to muscle it out of bad positions. That makes sense. Thanks for the explanations. Bigger the kite the better for airstyle it's coming back! Maybe ... but then there are the "phat" surf foils for waves and noodling about. Slow, but very cruisey. They need sweet FA to get them going. 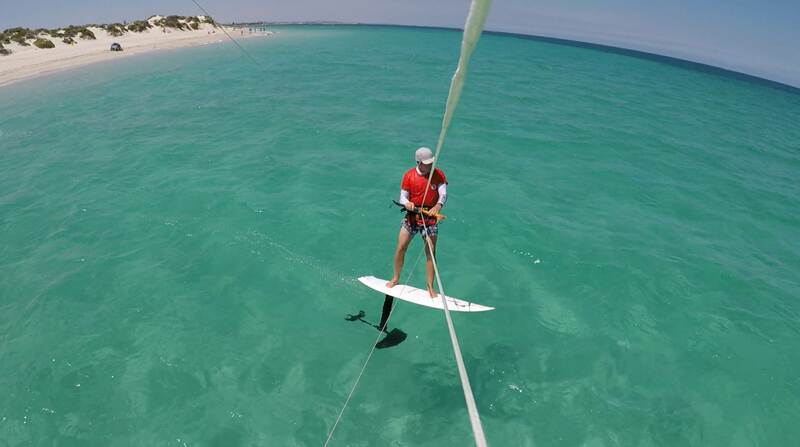 Dan from Kite Addiction did a downwinder in Perth on Saturday. On his surf foil and a 6m he said he should have had a 4m. That's what I was told. I'm and intermediate foiler, but I've already caught a couple of swells on borrowed phat foils, and let go of the bar of my 5m Drifter. It was magic. However, I am considering a larger foil kite just to push the boundaries a bit further. Plus there is still the old school big air enthusiasts. My latest kite purchase though was a 3 mtr single strut kite for use with the foil on 20+ knot days. I would never have dreamt of a 3mtr pre-foil days, the 5 only got used a few times a year. A 3m.. Nice.. what is it? I have a zephyr gathering dust since I started foiling. I have a TT gathering dust too for that matter. 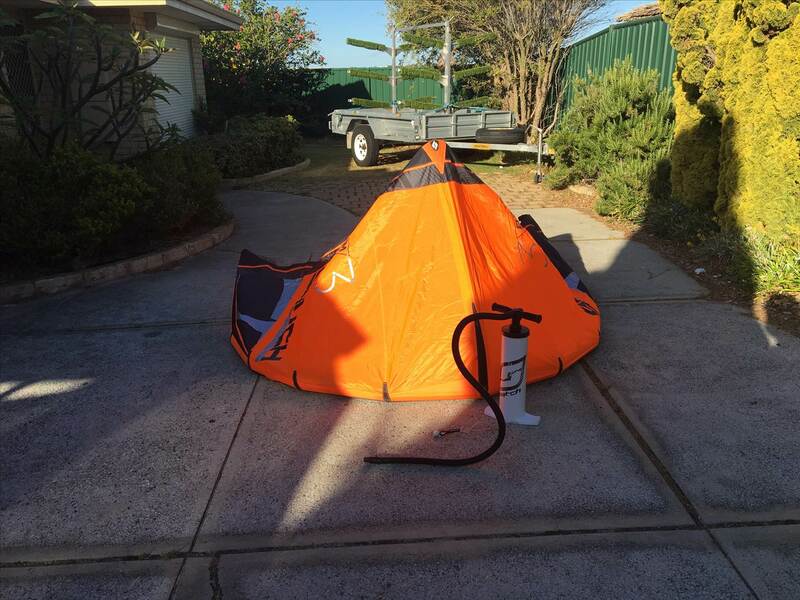 I did a lot of research and for me at 85kgs a single strut Mono 9m is my one kite quiver. If it flies I'm foiling. If it doesn't fly it relaunches much easier than many kites. I was out last Saturday morning in gusty 10 to 15. I was a kilometre or more upwind, alone on the far side of the lake and ripping up and down having a ball. I went bombing downwind at full speed to have a look at the cluster of TT riders near the launch. As I got close I saw maybe 10 kites, half on the water, and only one TT moving. I tightened up my line and ran across wind past everyone, then cut into the wind hard and raced back upwind, totally powered nearly to the max I could handle and cutting a crazy angle upwind. Foiling is magic. To be fully powered, racing along and yet fly a fast responsive kite in those conditions. To be able to play through 150 degrees or more in one smooth arc, the water becomes a real 360 degree playground not just mowing the lawn. I'm addicted. One thing that has struck me is the lack of kite expense needed When freeride mucking around (not racing) foiling. Although my axis foil cost a pretty penny, my fav foiling kite is a 200 hundred dollar 8m 2012 3 strut ozone catalyst. As said above if it can stay in the air and can drift... it's playtime? Im hooked to... still love my Old school TT stuff and some wave SB action but foiling is just a completely different dimension. Looking through this thread one thing is for sure, us foilers sure are a preachy bunch!!!! I half expect someone to come knocking on my door and say "have you heard of the book of foiling"
It's epic to see the stoke level from everyone and it has certainly injected a whole new energy into my kiting.